Discover the best of Argentina, Brazil, and Peru with a once-in-a-lifetime South America vacation package to the region’s most impressive destinations. Start off in Rio de Janeiro, Brazil, where you’ll enjoy the tropical climate and see the statue of Christ the Redeemer, named one of the New 7 Wonders of the World. From Rio you will continue on to the spectacular Iguazu Falls, arguably the most magnificent waterfall system in the world. From there, you will be dazzled by Argentina’s capital city, Buenos Aires, a city synonymous with sophistication and European style. Finally you will travel on to Cusco, Peru, the former seat of the impressive Inca Empire. You’ll get to tour the city, the nearby Sacred Valley, and the majestic Machu Picchu citadel – also named one of the New 7 Wonders of the World. Upon arrival in Rio de Janeiro, you will be met at the airport by one of our representative and taken to your confirmed Rio de Janeiro hotel. Start off your Brazil adventure with a private half-day tour up Corcovado, the mountain in the middle of Rio de Janeiro famous for its massive Christ the Redeemer statue. You’ll ride through Laranjeiras, one of the city’s oldest residential districts, and through the traditional Cosme Velho neighborhood. Here, you will board a mountain train for a scenic trip through the Tijuca forest, the largest urban forest in the world. Upon reaching the top, 2,300 feet above sea level, you’ll be greeted by spectacular 360-degree city views. Soak up the scenery and feel dwarfed by the 130-foot tall religious statue, one of the New 7 Wonders of the World. Following the tour, you’ll return to your Rio de Janeiro hotel to enjoy the remainder of the day at your leisure. In the morning, you will meet your transfer to the airport for your flight from Rio de Janeiro to Puerto Iguazu. Upon arrival, one of our representatives will meet you at the airport and take you to your confirmed hotel. Enjoy the rest of the day at your leisure relaxing at your hotel or exploring Puerto Iguazu on your own. Have a look at our Puerto Iguazu guide for detailed information on this destination. Enjoy breakfast at your hotel before departing for a full-day tour of the Iguazu Falls. The tour includes hikes along the Upper Circuit, taking you to elevated walkways leading to the edge of the major waterfalls comprising the system, and the Lower Circuit, a circular route allowing for incredible views from below of the waters crashing down. The tour includes an ecological train ride to the Devil's Throat, arguably the most impressive fall of the system, which you will be able to admire from spacious balconies along the edge of the falls. Although the Devil's Throat tour and Upper Circuit tour are mostly flat, the Lower Circuit involves a lot of stairs, so be prepared for some effort. Once you've had your fill of the breathtaking scenery, you'll return to your Puerto Iguazu hotel where you will have the remainder of the day to spend as you wish. After breakfast at your hotel, you will meet your transfer to the airport for your flight from Puerto Iguazu to Buenos Aires, the vibrant capital of Argentina. Spend the afternoon at your leisure, resting at your hotel or exploring Buenos Aires on your own. Have a look at our Buenos Aires guide for more information on what to see and do. You’ll end your day discovering tango at one of the most exclusive Buenos Aires tango houses, Tango Porteño. Enjoy a delicious gourmet dinner while musicians and professional tango dancers perform before you. Tango shows in Buenos Aires can be compared to broadway shows, with a live orchestra accompanied by professional tango dancers. Enjoy an exciting half-day Buenos Aires tour of the city’s highlights. You will start your tour in the city center to see the impressive National Congress (the Parliament), the beautiful Plaza de Mayo surrounded by the Casa Rosada (Government House), the Metropolitan Cathedral, and the splendid Cabildo, which served as City Hall under the Spanish colonial rule. You will then continue on to Puerto Madero, Buenos Aires' modern financial district, where you'll learn about the fascinating transformation of this lively neighborhood. Your next stop is La Boca, where the Bombanera soccer stadium and the large population of Italian descent showcase Argentina's passion for soccer. In the San Telmo neighborhood, the heart of tango, you will learn about the history of this beautiful, sensual dance that has become the symbol of Argentinean culture. Finally, you will visit Palermo and Recoleta, the city's upscale neighborhoods where the Porteños (inhabitants of Buenos Aires) come to indulge in high class shopping and gourmet cuisine. At the end of the tour, you will return to your hotel and have time to enjoy your final day in Buenos Aires at your leisure. Prepare for your journey to Peru! Meet your transfer to the airport for your flight to Cusco via Lima. Upon arrival to the Cusco airport, a Peru For Less representative will meet you for the drive to your hotel in the historic center. On the way to your hotel, you will see examples of Spanish colonial architecture constructed upon the remains of ancient Inca palaces and temples. Spend the morning at your leisure. This is a good time to explore some of Cusco's less-visited attractions including the San Pedro Market, the bohemian neighborhood of San Blas, or one of the many museums, such as the Museum of Pre-Colombian Art, Casa Concha, or the Choco Museum, where you can make your own chocolate from scratch. Your exploration of this remarkable city begins in the early afternoon with an expert-guided Cusco tour. You will visit many of the amazing archeological sites in and around the city, including the Cusco Cathedral in the Plaza de Armas as well as Temple of the Sun, and the ruins of Sacsayhuaman, Q'enko, Puka Pukara, and Tambomachay. In the late afternoon, you'll return to your Cusco hotel. Spend the evening at your leisure enjoying the local cuisine and the hospitality of the Cusco locals. Check out our Cusco Travel Guide for suggestions of where to go and what to see. Explore the beautiful Peruvian countryside with a full-day tour of the magical Sacred Valley. First, you will visit the town of Pisac, famous for its bustling market and beautiful Incan ruins that loom over the city. In the market you will have the opportunity to browse the beautiful handicrafts and Andean garments displayed for sale as well as local fruits, vegetables, and other natural products. While at the Pisac ruins you will be able to see ceremonial and cemetery areas, as well as amazing views of Pisac and the surrounding valley from above. In the evening, you will be taken to your comfortable hotel in the Sacred Valley. Next, meet your expert English-speaking guide for a 2-hour tour of the most important sites in Machu Picchu, including the Intihuatana (Sun Stone), the Sun Temple, and the Room of 3 Windows. You will be able to appreciate the intricate stonework and awe-inspiring setting of this amazing site. Check out our Machu Picchu Travel Guide for more information on what to see and do during your time at Machu Picchu. Enjoy the artful hospitality and sophisticated comfort of the Buenos Aires Grand Hotel, located in the exclusive Recoleta neighborhood. This 5-star luxury hotel offers everything you need to rest and relax after days spent exploring the city’s top attractions such as the nearby Recoleta Cemetery and the Teatro Colon. Hotel facilities include 90 guest rooms, a cafe, restaurant, bar/lounge, full service spa and health center, with a professional, multilingual staff ready to serve all your needs. Located just moments from Galerias Pacifico and Florida Street, El Esplendor holds up to its name and is truly splendid. The grand exterior and its warm lighting invite you to the stylish lobby featuring modern décor, ambient lighting, and stylish artwork. There are very spacious and well-furnished en-suite bedrooms, some with balconies overlooking the streets of Buenos Aires. The professional staff is very helpful and friendly adding to the superior service offered by the hotel. Conveniently located in the center of Buenos Aires, only a few minutes away from Colon Theater and the Obelisk, Forcadell Apartments offer spacious and comfortable apartments with fully equipped kitchens. This classic French-style building boasts a beautifully decorated interior and contemporary design, as well as all the amenities you could wish for. Guests can savor a delicious meal at the restaurant or unwind sipping a cocktail at the bar after a long day exploring Buenos Aires. Among the amazing amenities of this excellent hotel are a Fitness center, laundry service, 24h front desk, wireless Internet, car rental, and many more. The brand new Aranwa Boutique Hotel, opened in October 2010, is operated by Aranwa Hotels Resorts & Spas, one of the most luxurious hotel chains in Peru, known for their careful attention to their clients’ well-being. Probably the best value luxury accommodation in Cusco, this elegant 5-star hotel is housed in a converted 16th century mansion and is decorated with colonial era furniture, impressive paintings from the Cusco school, and colonial gold-leaf plated carvings and sculptures. With each room boasting an oxygen system and a variety of soothing spa treatments available, this just may be the best place to acclimatize to the high altitude in Cusco in a most comfortable setting. The Casa Andina Private Collection Cusco is the most recent addition to the renowned Casa Andina Hotels. Built in a large colonial house dating back to the 18th century, the hotel is ideally located in the center of Cusco, just a few blocks from the main square in the direction of Koricancha. Relax in the beautiful courtyard with its gurgling stone fountain, one of Cusco’s emblematic colonial sights, and get lost in the intriguing maze of corridors that lead you to the various patios. Located in the historic artisan’s quarter of San Blas, this boutique hotel is privately situated, but still close to restaurants, bars, artisan workshops, and galleries. Only two and a half blocks from the central Plaza de Armas, the Boutique Hotel Casa San Blas is near all the main attractions in Cusco, but provides the peace and tranquility guests look forward to after a long day exploring Inca ruins. With gorgeous wooden furnishings, a pretty terrace area with umbrellas, potted plants, and colorful artwork, you will feel at home in this charming hotel. Built on the grounds of a seventeenth century colonial hacienda, along the tranquil banks of the Vilcanota River, the Aranwa Sacred Valley Hotel is the picture-perfect place for a countryside retreat. The hotel showcases a fusion of minimalist interior designs and colonial style buildings, all surrounded by sweeping views of the breathtakingly beautiful Sacred Valley. A prominent member of the Casa Andina chain, the Private Collection is a luxurious Sacred Valley hotel, comfortably nestled in the heart of the valley only 10 minutes from the ruins of Ollantaytambo. Combining relaxation in its luxurious spa with sports activities such as bike riding or hiking, this excellent hotel encompasses a range facilities and amenities to suit all taste. The hotel also features a delicious restaurant, playgrounds, a jewelry store and an on-site observatory allowing guests to admire the beautiful star-filled Andean sky. Adjacent to the Ollantaytambo train station, this quaint bed & breakfast is nicely located at the midpoint between Cusco and Machu Picchu, making it the perfect place to rest before visiting the mountaintop ruins, the historic city of Cusco, or the surrounding Sacred Valley attractions. This hotel originally started operating in 1925 and was the first hotel to open in the area. A 10-minute walk takes guests to the main plaza of Ollantaytambo, an original Inca city definitely worth exploring. Ideally located near the Aguas Calientes train station and close to where the buses depart for the short ride to Machu Picchu, the recently renovated El MaPi Hotel is perfect for travelers who want to catch the sunrise over the ruins. The modern and stylish hotel aims to be the best in its category and offers great value services and décor. It also boasts beautifully landscaped gardens and a hot tub where guests can relax at night with a cocktail after a delicious dinner. Travelers looking for convenience and a touch of luxury during their Machu Picchu travels will be pleased with this excellent hotel. Situated just 650 feet from the train station, this wonderfully appointed establishment boasts 31 fully equipped and tastefully decorated rooms. Each accommodation features wooden furnishings, a large bed covered with comfortable bed linens, and some rooms even feature breathtaking views of the river. Andean art adds the finishing touch to the room. During this tour you will pass the Iguazu River, to Argentina’s Iguazu National Park. Trails through the 55,500 hectare reserve provide a different, complete view of the falls, especially the biggest one, the Devil's Throat. Lower and upper walkways permit a closer look at the waterfalls. Explore the Argentine side of the Iguazu Falls on this Safari and Cruise adventure. Start with a exciting drive through the jungle in an all-terrrain vehicle. The open-air vehicle makes for a great vantage point to see parakeets, parrots, macaws, toucans, lizards, monkeys and more along the trail. Next, continue your adventure by boat, navigating along the river and through rapids until you reach the Devil's Throat Canyon. The boats that will take you breathtakingly close to the falls - so be prepared to get very wet! On this tour you are able to travel in an electric jeep that allows you to explore the jungle area around the falls. You will visit the roaring Macuco waterfall and then go by boat up the canyon to see the waterfall’s canyon. On the way, you’ll be able to stop to look for various wild animals, particularly in the early hours of the morning or late afternoon. The Itapúa Dam is one of the biggest building sites in the world. Since 1975 the dam has provided a model of green energy, providing most of the power to the nation of Paraguay. Only the new construction of a dam in China will beat this mighty feat of human engineering. On the tour you will learn about the dam’s construction and see beautiful areas of the lake. The dam is open to visitors every day except Sundays and Brazilian public holidays. 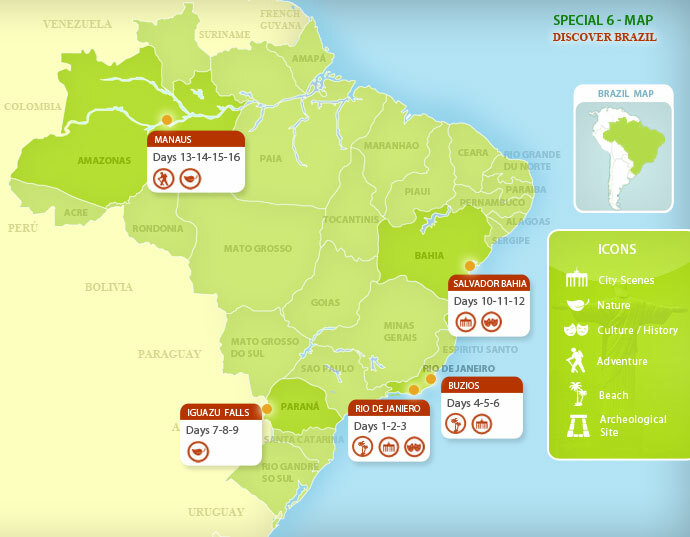 Note: This trip can be combined with a trip to the Brazilian side of Iguazu Falls to make it a full day trip to Brazil.